Many people like to go to Disneyland in the fall (September, October, and November), especially after the kids go back to school. Attendance reaches its lowest levels on the second Tuesday of September and stays low, except over Columbus Day weekend (second Monday of October). However, it gets very crowded at the end of November, especially during Thanksgiving week (fourth week of the month). You can have a lot of fun at Disneyland anytime it's less crowded, but if you want to see it with a different look, plan to go after the Halloween decorations go up, or wait a bit longer until the Haunted Mansion makes its annual transition to Haunted Mansion Holiday, themed after Tim Burton's film Nightmare Before Christmas. Fall is also the time when you'll see more of Disney's villain characters like the Wicked Witch, Cruella DeVil, and Jack Skellington out and about, too, especially in October. And if you like to sample new foods, Disneyland always has new menu items for autumn and the Halloween season including seasonal caramel apples. Steakhouse 55 in the Disneyland Hotel may be hosting a Halloween-themed menu at their afternoon "Trick or Tea." Weather varies during the fall. In September, it averages 77ºF/25ºC, but by November that's down to 70ºF/ 21ºC. It's not likely to rain in September and October, but by November you may encounter some rain, with up to 2 inches falling during the month. You can take a look at the average monthly temperatures and climate at Disneyland and in Anaheim. What to pack also varies with the weather. You can find monthly packing tips in the guides to Disneyland in September, Disneyland in October, and Disneyland in November. In general, it's always best to pack comfortable shoes that you have worn before, avoid dangling jewelry that can get caught in things and get lost, and try to keep your bag as light as possible to help you keep from getting worn out just lugging it around. If you plan to go on water rides like Splash Mountain and Grizzly River Run, quick-drying clothing and a change of socks are also a good idea. The Disneyland Resort sometimes schedules fall events, which you can find on their website. That includes a small Day of the Dead (Día de los Muertos) celebration in Frontierland. Gay Days at Anaheim happens the first week of October. Dapper Day also happens in the fall. It's an unofficial event when people may dress up in their dapper, old-fashioned dress-up clothing. You'll also find some fun, retro-themed events to attend and they sometimes offer group discounts on tickets. A few days in fall may be busier than most because of local school schedules. A simple way to get an idea of when Disneyland expects bigger crowds is to find out which days have longer hours. The shorter the hours are, the smaller the crowd they're expecting. You can check the daily hours on the Disneyland website. Because school holiday crowds are mostly locals, you can get another clue by checking the block out dates on annual passes, especially the most restrictive southern California resident pass. Other busy times in the fall include the three-day Labor Day weekend (first Monday in September) and a day or two after the Christmas holiday decorations go up in early November, which sometimes draws near-capacity crowds. Thanksgiving Day (fourth Thursday of November) is one of the busiest days of the year. Halloween (October 31) brings some great decorations. 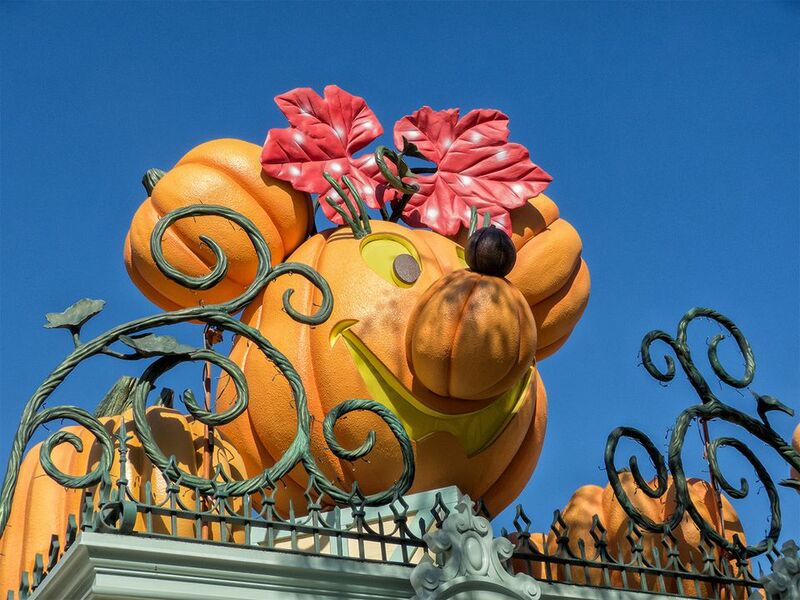 Take a look and find out about what's special at Disneyland for Halloween. Haunted Mansion closes in early September so it can be transformed into Haunted Mansion Holiday. It's a Small World closes in early November so it can take on its winter holiday look.